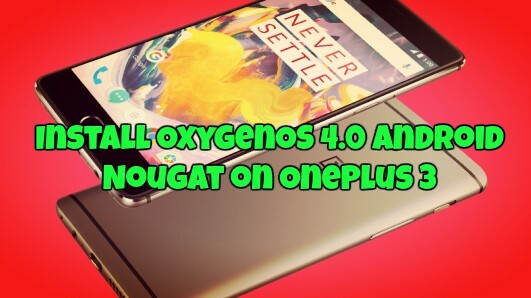 Oneplus 3 Android phone received the official OxygenOS 4.0 Android nougat. The new update comes with lots of new features like new Notification and setting menu design, multi window, and custom DPI support. The OTA update of the official version is already out and many Oneplus 3 users updated their device with the new OxygenOS 4.0 Android Nougat update. Here in this guide, we’ll show you how to download and install OxygenOS 4.0 on oneplus 3 manually. Update Oneplus 3 to OxygenOS 4.0 Nougat manually with below method. Download OxygenOS 4.0 for OnePlus 3 from below. Read all the steps very carefully and follow all the steps one by one on your phone, This guide is only for the Oneplus 3 users and don’t follow the below mention tutorial on any other Oneplus phone. All you need the latest OxygenOS 4.0 Zip file and you can update your oneplus 3 with this Android nougat update. 4. Connect the Oneplus 3 to the PC with USB cable and open a command prompt or terminal on your PC. To do this open the ADB folder press shift + right click and click on open command here. 1. Download the OxygenOS 4.0 zip from above and save the zip file on your phone internal memory. That’s it. Now the OxygenOS 4.0 Android Nougat is successfully installed on your Oneplus 3 Android phone. Let us know if you have any questions by comment below.